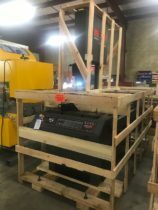 Vertical Tilt-Frame Band Saw 380A-PC3-60 – Featuring the PC3 Control this saw includes: Automatic indexing, mid-duty, hydraulic, metal cutting, high-speed band saw with programmable control. 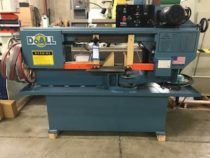 Capacity 15″ x 20″, Complete with: Variable Vise Pressure, Work Lift Roller on Entry Side of Machine, 2nd Machine Vise, Hydraulic Hold-downs on both machine and shuttle, Automatic Mist Lubrication & Powered Chip Conveyor. 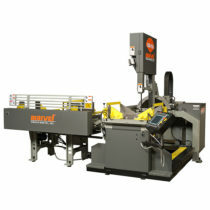 Capacity: 8” x 11.5” Rectangle (200 x 300mm), 10” Round (250mm). Blade: 1.25” x .042” x 11’ 6” (32 x 1.07 x 3505mm). 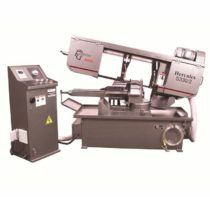 Vertical Tilt-Frame Band Saw 8-Mark-III – Latest version of the worlds most popular band saw that has miter cutting up to 60° left and right. 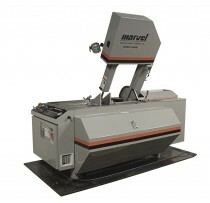 All-mechanical, universal, metal cutting, band saw machine. 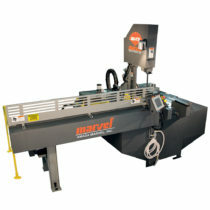 Capacity 18″ x 22″, Complete with: Power Column Tilt, Automatic Mist Lube, Second Machine Vise & Digital Tilt Readout.